Incidence of injuries and other health problems is known during prolonged running and recent studies suggest that exercise-induced damage may trigger production of pro-inflammatory molecules. The present study investigates to what extent prolonged strenuous exercise influences the plasma concentrations of procalcitonin as well as cytokines inhibitors and anti-inflammatory cytokines. After informed consent, 4 marathon runners and 10 half-marathon runners were recruited and investigated 12 h before running, immediately after the end of the run and 24 h later. Blood samples were collected at each time and PCT concentrations in plasma were measured with a luminometric method (Brahms). The plasma concentrations of TNFα, IL-1β, IL-6, IL-1 ra, sTNF-r1, sTNF-r2 were measured by ELISA. Statistical analysis used Systat (Jandel). The mean duration for marathon running was 235± 18 min and 105± 10 min for half-marathon running. The highest concentration of IL-6 and TNFα was found immediately after the run. 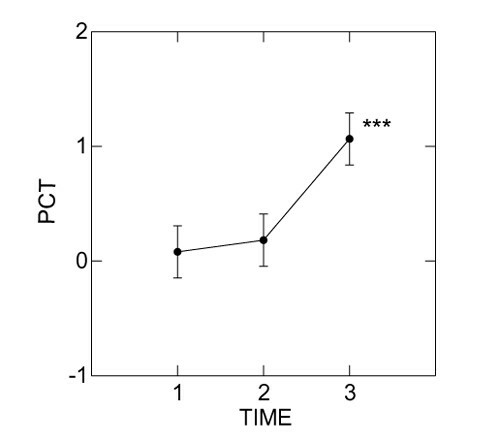 Time course (1 = 12 h before; 2 = immediately after and 3 = 24 h later) of blood PCT, ng/ml is presented in the figure (P<0.001). This study suggests that long-distance running may trigger production of TNF α and pro-inflammatory cytokines, which stimulate the production of PCT. As it has been demonstrated in sepsis, PCT may be an early marker of elevated cytokines and muscle and/or splanchnic damage.